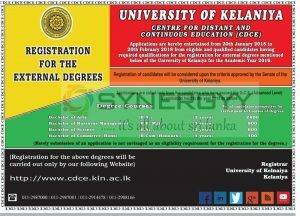 University of Kelaniya – Centre for Distant and Continuous Education (CDCE) invites applications for the range of External Degree Programme for academic year of 2018. Applications are hereby entertained from 20th January 2018 to 20th February 2018 from eligible and qualified candidates having required qualifications for the registration for external degrees mentioned below of the University of Kelaniya for the Academic Year 2016. Registration of candidates will be considered upon the criteria approved by the Senate of the University of Kelaniya. Is a 3 years degree programme and 2400 candidates are propose for the recruitment of this degree. It’s a 3 years degree programme and 900 candidates are propose for the recruitment of this degree. It’s a 3 years degree programme and 600 candidates are propose for the recruitment of this degree. It’s a 4 years degree programme and 400 candidates are propose for the recruitment of this degree.